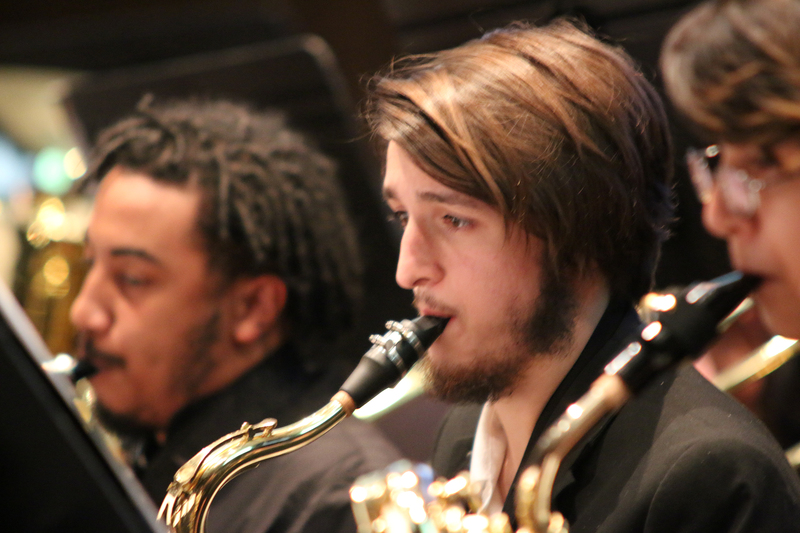 Panola College Band and Jazz Band performed in concert on Thursday, Oct. 25, in the Q.M. Martin Auditorium. Dwaine Hubbard, director and professor of instrumental music, said the concert theme of “Southwest Saga” featured a musical journey through the Lone Star State. Opening the concert was “Hubbard’s Legion,” by Timothy Rhea. This piece was commissioned by Carthage High School Band Director Nicholas Durham in honor of Dwaine Hubbard’s service to the CHS band from 1985 to 1998. Next, the band performed “Blanco Canyon Sketches,” by James Sudduth; “Gospel Echoes,” by Fred Allen, and “Southwest Saga,” by Robert Sheldon. During the performances, images from across the Texas landscape were shown on the screens. After a brief intermission, the Panola College Jazz Band took the stage, opening with “Welcome to the Jungle,” by Guns N’ Roses, featuring soloists Savana Hanaway on flute and Elijah Johnson on alto saxophone. Whitney Ramsey played a solo on tenor saxophone for “She’s Gone Away,” by Ralph Gingery, and she and Makayla Miller on trumpet were featured in “The Lady is a Tramp,” by Rodgers and Hart. Whitney was also featured soloist for “You’re Welcome” from the movie “Moana”, written by Lin Manuel Miranda. Rounding out the Jazz Band performance were “Learn to Fly,” by the Foo Fighters, and “Uptown Funk,” by Mark Ronson and Bruno Mars, featuring soloist Nicklaus Powell on drums. Members of the band include on flute: Ma’Kayla Campbell, Madison Cichoraki, Jessica Coats, Maricruz Gonzalez, Savana Hanaway, and Perla Mateos. On clarinet: Chelsea Ener, Kirsten Mayfield, Destiney Miller, Emily Ortiz, and Samantha Stilley. On bass clarinet: Lucero Luna. On contra-alto clarinet: Megan Gilley. On bassoon: Whitney Ramsey. On saxophone: Kassi Orbaugh Elijah Johnson, Selena Mendoza, Alex Rodriguez, and Lydia Woods. On tenor saxophone: James Lilly and Whitney Ramsey. On baritone saxophone; Somali Fletcher. On trumpet: Sarah Allen, Kaleb Baker, America Cabriales, Ruben Hernandez, Miguel Mendoza, Makayla Miller, Mahiko Moreno-Flores, Brandon Renteria; Maggie Sims, and Josh Wood. On French horn: Sarah Allen, Mauricio Alejaldre, Dakota Brown, Erica Lee, Jose Torres, and Maddox Whitaker. On trombone: Dakota Brown, Jaime Gonzalez, Hernan Hernandez, Tressie Key, and Eder Nunez. On bass trombone: Carrie Lilly and Steven Sierra. On baritone: Colby Taylor, Jessye Massey, Makayla Bell, Demetrius Cooper, and Andres Leon. On tuba: Martravian Williams, A.J. Bowers, Steven Sierra, and Daniel Quetzala. On percussion: Nicklaus Powell, Itzel Farias, Moses Sangowoye, Godwin Adewale, and Crystal Whitehead. On piano: Carrie Hudman.